Nice looking reel ready to go for another round! Many of us have a special preference, some type of gear that we feel really attached to based on what we grew up with, and I feel that way about open faced spinning reels. While there’s nothing against closed face reels or baitcasting reels, I grew up learning how to fish with spinning reels so those are the ones that hold that special place in my heart. That’s why we really wanted to do an article on best open face spinning reels. Fortunately, Dad had good taste. 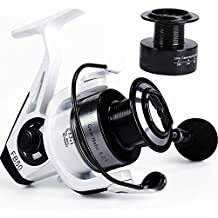 These are excellent pieces of fishing gear and still to this day remain my personal favorite type of fishing reels (apologies to fans of the other reels and no offense intended). While we just referred to them as open faced reels, I’ve realized since then that is more of a general descriptor and that spinning reels are the ones that we used while growing up. No doubt as we start teaching the little ones how to fish, we’ll be using these reels to get them to end up loving fishing just as much as we did. Now with all of that being said, let’s take a look at what we view as the top rated spinning reels out there – and there are more than 10 outstanding open faced options to feel out this list! There are many fantastic options out there when it comes to finding the perfect spinning reel. Whether you need something for freshwater or saltwater, you have an impressive array of options following here. We were actually very happy, and very impressed, with the sheer number of options that anglers have for open face spinning reels, meaning no matter what rod you go with, whether for tough northern pike fishing rods or something else entirely, there are going to be reels here that help create the perfect fishing combination. Note: These are general rankings taking many different factors into account for general overall rankings. The third ranked might be the highest quality, but 10x the price of the one ranked first, or one might not be very good versus exceptional, but be affordable on a child’s allowance – go to the actual reviews for more in-depth reviews and know all the reels on this list are high quality for what they do. KastKing Summer Spinning Reels & Centron Spinning Reels Outstanding versatile reels that do a bit of everything well at a great price. Daiwa BG Spinning Reels Truly premium next level spinning reels - arguably the finest spinning reel made in years. Okuma Ceymar Lightweight Spinning Reel Versatile and outstanding design with each style focusing on a specific niche of fish to provide an effective model for every angler. Penn Battle II Spinning Fishing Reel Outstanding heavy duty reel perfect for saltwater fishing. Penn Pursuit II Spinning Fishing Reel The second entry from Penn Pursuit and a stunningly good strong lightweight reel for beginners. KastKing Sharky III Fishing Reel Trusted brand with a stunningly strong reel perfect for chasing the big trophy fish. Daiwa Revros Spinning Reel Another one of the most expensive options on here, but if you only care about quality one of the best offerings on here. Piscifun Venom Spinning Reel Good lightweight reel offering some premium features. Burning Shark Fishing Reels Might have a funny name and look, but they are a truly stunning quality of reels. Sougayilang Fishing Reel Trusted brand with a long history of quality. Shimano R4000 Spinning Reel Inexpensive option good for smaller freshwater sports fish. YONGZHI FB50 Saltwater Spinning Reel Very good inexpensive option for beginners learning the ropes. 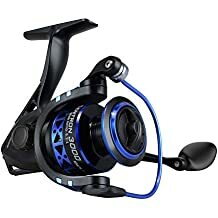 This is sort of a two series under one brand entry, but they’re combined on Amazon and basically the same high quality design although the aesthetic is clearly very different between these two great options for KastKing spinning open faced reels, and there’s a reason they have been so stunningly popular with new and experienced anglers alike. 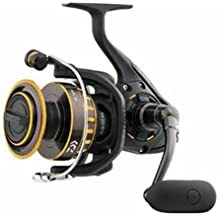 Basically the same reel with major aesthetic differences based on whether you prefer the traditional dark look the Centron series brings or the eye popping color of the Summer series, you’re not going to go wrong if you have one of these outstanding reels. These freshwater spinning reels are very high quality, and are our top choice in strong point because it is where premium construction, excellent features, outstanding design, and reasonable price tend to meet. If you want a spinning open faced reel that looks to take on that challenge “Jack of all trades, master of none” and prove a Jack can indeed be a king, then this is the reel you’re looking for. The graphite frame design gives top notch balance while allowing a lot of power and control all from a compact design. This is a strong, effective, and versatile reel that is fantastic for a wide variety of popular game fish including trout fishing, bass fishing, pike fishing, northern pike fishing, and more! 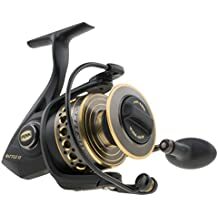 This reel is built with 9 quality ball bearings (this is true of both Centron and Summer designs) allowing it to run smooth and easy while it functions at the highest possible level. There are slight variations with each model, but they are all extremely similar and deserve to be under the same high umbrella ranking. The reels are corrosion resistant, but they are freshwater reels so are not tested under countless hours of saltwater – be sure to note this if you’re looking for a saltwater option instead. An outstanding drag system and precision pinion gear system means you will be able to enjoy incredible control while featuring a reel that is high quality and gets the job done. Perhaps my favorite feature as someone who is ambidextrous: the unique handle design means this can be put together for left handed anglers or right handed anglers. The spool from machined aluminum is the perfect compliment to the graphite frame and together creates the type of reel you can feel great about dropping cash on. The Daiwa Black Gold spinning reel is a truly outstanding spinning reel that really is one of the premium options available to the average angler. The Daiwa BG reels aren’t going to be cheap, but this is a prime example of letting quality prevail, and fans of the traditional Daiwa spinning reels are going to be thrilled with this model. Although Daiwa has been producing open faced spinning reels for over 60 years (since 1955), this model really stands out as being a innovative design built from truly quality materials. 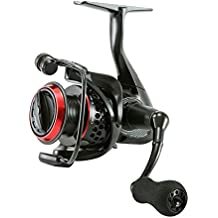 This reel is available in 10 different sizes, and they are clearly leaner, meaner, and even better than previous comparable Daiwa spinning reels from previous years. These are versatile reels that can be used for great touch and control during ultralight freshwater fishing or larger sizes can be combined with the right lines to take on big game saltwater fish. 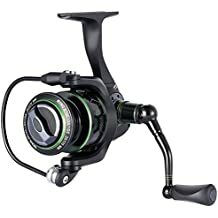 These are truly remarkable reels and while for budget anglers they may seem expensive, for many of us who have tested some premium high end reels, we can’t believe this is as inexpensive as it is when comparing it to similar reels that can actually perform on the same level (many of which are $400-600 range or more). Many anglers argue that this is one of the best value spinning reels out there. While the price might be generally higher than average, the jump in quality takes it to another level and means it is still a top notch deal. In fact many anglers are retiring Certate, Stardic, Saltigas, and Stella reels in order to replace them with what Daiwa provides here. While many Daiwa fishing rods are pointed out internationally as among the best carp fishing rods out there (as we talked about in our best carp fishing gear article) but these reels will work for virtually anything. 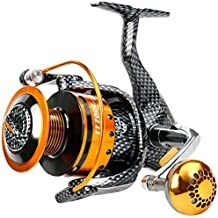 This is a spinning real that can handle almost any type of fishing line, as well, and has no problem handling monfilament, braided, or any other normal type of sports fishing line. The only potential downside is that this is surprisingly heavy for a “lightweight reel” but the ability it shows to give extra power to your casts and handle really heavy duty, the trade-off is definitely worth it. The Okuma Ceymar spinning reel has gained an impressive number of positive reviews and for good reason! 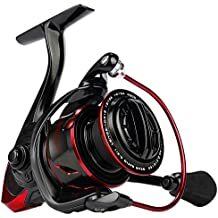 Featuring a 5.0:1 gear ratio and a quality ball bearing system featuring 7 regular ball bearings to one reverse bearing, this is an excellent spinning reel. Available in 5 styles starting from the C-10 that is the smallest in the family to the large and powerful C-65 for big time fishing needs, there’s a lot that Okuma Ceymar spinning reels have to offer. This is a reel that is ambidextrous in nature and allows for both right handed and left handed anglers to get in on the action. This is a very well built design, and depending on what type of fishing you prefer, you will want to match up with the right style, although there’s no reason not to have 2 or 3 especially if you tend to do a lot of different fishing like bluegill & sunfish, trout, and big bass and northern pike. Different fish require different equipment, after all! As you can see these reels are built for different sizes and different amounts of line based on what you are going after. This is an exceptional reel that even comes with a limited one year limited warranty. You won’t be disappointed if you go with this particular reel. While currently available in 8 different styles ranging from the small and svelte 1000 up to the more heavy duty 8000 style, these Penn Battle II spinning reels are an outstanding combination of durability, touch, and smoothness that lets you handle everything from the initial hit to the reel in and netting. This is a durable reel that is ideal for going after some of those saltwater fish off of the coast. The reel is durable, features a full metal body with side plate, as well as an aluminum bail wire that gives this reel some of its legendary durability. The Penn Battle II reel also features a carbon fiber drag system that gives a seriously powerful drag and they manage to do that with a 5 stainless steel ball bearing feature that keeps that high powerful drag under control without sacrificing smoothness. That means you get power, casting range, durability, and smoothness all in one package. Not a bad deal, right? This is a reel that is designed with major fights with good sized saltwater fish and will hold up to salt, water, and pressure over countless encounters. This is a great option for independent anglers or certain guides alike, and it is suitable for Berkley or Spiderwire superline, and this is good for monofilament or braided line. Whatever your needs here, this reel will take care of you. The Penn Pursuit II style of fishing reel is an open faced spinning reel that provides some serious premium performance at a price that budget strapped anglers can afford. These reels feature durable construction that will last the test of time that includes a graphite body and aluminum sideplate, as well as a graphite rotor that works together for an impressive amount of drag pressure without sacrificing a single ounce of smoothness. The fluid cranking motion that results means a better fishing experience, and an ergonomic handle will mean even on those days where you’re killing it, your fingers, hands, and wrists won’t be the first part of your body to call it quits! You’ll feel good even after a full day of reeling those big fish in! 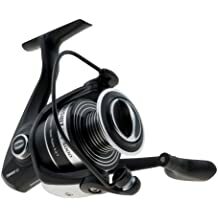 This is a great reel for the price, and currently is available in 5 sizes/styles. A great reel in general, and a truly outstanding one for entry level beginners, there’s a lot that this brings to the table and it is a reel fully capable of using braided line that not all reels can handle well. KastKing shows up again, which shouldn’t be a surprise considering they are a trusted name brand that has been widely lauded by experienced anglers for many years now. While we’ve already gone over some of their most popular reels, this list wouldn’t be complete without bringing out the Sharky III style of fishing reels. Available in five models, though the 2000 and 5000 seem to be the two most popular choices by far, the Sharky III reels from KastKing look great, are built rock solid, and hold up whether used for freshwater and saltwater fishing outings. Offering a combination of extra lightweight materials and a body made from reinforced carbon fiber. In other words light and durable, just want you want out of a quality versatile fishing reel! For its class the Sharky III has a truly outstanding drag of up to 39.5 lbs, more than matching most of the competition. This comes from the unique design that helps dictate every single part of the reel as being truly top notch in order to provide the best overall results. This smooth working and strong reel is a great addition to any freshwater or saltwater angler looking for that monster fish to reel in and wants equipment that will hold up when that big fight comes. The Sharky III is a fantastic option for these anglers, and won’t let you down when you hook that big one you’ve been chasing! The Daiwa Revros spinning reel is a very high quality reel made from a composite body, featuring incredibly high level aluminum, and is currently widely available in 4 sizes (2000H, 2500H, 3000H, 4000H) although more may become widely available in the future. Designed to be lightweight and highly sensitive without losing strength, this 8 bearing system design has become very popular with a wide array of experienced anglers and it isn’t hard to see why! This reel is ambidextrous in nature, meaning you can attach the handle to the right or left depending on what hand you use most, turning it into a left-handed reel or right-handed reel in a matter of seconds. That type of versatility is incredibly helpful, especially for a family with plenty of righties and Southpaws – you want versatile fishing equipment in those situations. This reel runs off an 8 bearing system and the pool is machined from high quality ABS aluminum. Many anglers have raved about this Daiwa design, as well as the earlier one, making the comment of how it often performs at a very high premium level without costing an arm and a leg. Not going to be the cheapest on the list, but the value for the price is really exceptional. The reel is especially quiet and smooth, making it a fast favorite among many anglers who have gone a bit too long since the last time they picked up a new reel to take out on the water. This is a fine spinning reel, and from a reliable and well known brand that has appeared in several other of our fishing articles, and for good reason! Piscifun is a very solid brand that creates solid fishing equipment that might not be as elite as Daiwa products, but they deliver high quality at a reasonable price so even cash strapped beginners have no problem getting started. There are multiple models of this open faced spinning reel available and one of the major positives is that this particular reel is all set to go for braided line. The spool is machined aluminum and braided line can be tied directly to the spool without any worry of slipping. Light weight, long lasting, and featuring an outstanding triple carbon fiber drag system creates an outstanding amount of stopping power when you need some heavy drag to make sure you can handle those hard hits from either saltwater or freshwater fish. This is an outstanding option for anglers who like to bounce between both but need fishing equipment that is affordable. These reels are smooth, silent, dependable, and they have the anti-corrosion protection you would expect from an outstanding versatile reel. For quick reference, the braided line capacity of each spool on this Piscifun Venom reel by model is listed below. Some anglers are a bit put off by the name “Burning Shark,” imagining a snarky startup more about marketing than about the outdoors, but those anglers would be dead wrong! So far the reels put out by Burning Shark not only have a unique awesome look, but beyond the beautiful aesthetic, these reels have also proven to be outstanding equipment that have held up to even the most discerning and demanding angler’s judgement. 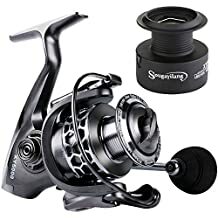 In other words, this 12 stainless steel ball bearing reel design with a 5.1:1 gear ratio has proven it belongs in any conversation on the best spinning reels currently available. We have a feeling this will continue to be true well beyond 2018, as well! 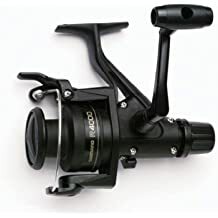 This is a high quality and versatile spinning reel that can be used for freshwater fishing, saltwater fishing, on shore or on the boat, this reel can go with a variety of rods and handle whatever you throw at it. The composite material is outstanding at resisting wear and corrosion of all types. This is an improvement even from the first critically acclaimed designs and this creates a reel that holds up, runs smoothly, and isn’t going to give in to salt exposure, heavy use, or any of the normal causes of cheap reel wear. The Burning Shark fishing reel may have an unusual name, but they’re deadly serious about being one of the best when it comes to outstanding fishing reels. Available in multiple sizes, the Sougayilang fishing reels are excellent examples of why cheap spinning reel doesn’t necessarily mean low quality. This is a smooth spinning reel that is resistant to corrosion while giving top notch performance whether in freshwater or saltwater. This is a strong reel that uses brass gears and goes with a traditional hardened metal shaft. Add in drag washers made from a special carbon and an aluminum handle that can be attached to the left or right hand side and you will quickly find yourself appreciating this budget option for anglers who don’t want to spend a lot but still demand a high level of immediate quality to their gear. These reels have a strong drag system and that allows you to put up a fight with the really big fish and stop them from running the reel empty. The hollow frame design and special balancing system means this is a lightweight reel that still gives a strong sense of stability and support, the kind you usually expect from heavier pieces of fishing equipment. There’s a lot to like about this reel, and a non-slip knob designed for maximum comfort and the handle means your hands and wrists will last out on the water as long as your will power does. Very solid budget spinning reel, and one of the top rated gems as an inexpensive pickup for anglers of all experience levels. The Shimano R4000 open faced spinning reel is one of several excellent options from Shimano. While many of their reels are designed to be specially focused, the R4000 is a general use freshwater reel that provides plenty of yardage for 6 lb, 8 lb, or even 10 lb test line. This is a little less aimed at trophy fish and more at smaller game fish in most cases. Then again, depending where you are 10 lb test line is plenty (you need a really good day to beat a bass or walleye that size), though the drag can only be set to a maximum of 7 lbs which means this isn’t up there with the premium models at all but the lightweight nature of this reel along with the inexpensive price makes it a good starting model for many anglers. Featuring a graphite frame, sideplate, and rear-drag setup, there is still a lot to like here. While it says it is approved for saltwater use, many anglers have reported being much happier when limiting this to a freshwater reel. Highly reviewed and generally well ranked, as long as you avoid using this as a main saltwater rod or expecting true premium quality at a beginner’s price, you will avoid 90% of the complaints that come with this reel and find it to be an excellent option to work into your rotation. This is a good looking reel with a white on black color combination that is both classic cool as well as modern aesthetic look. This is a reel that looks great, works well, and is advertised as being excellent for summer and autumn fishing. 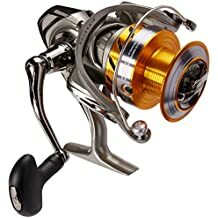 Made from stainless steel, this is a durable construction that is excellent for freshwater fishing and comes in a variety of sizes to make sure there is a style of this specific reel that can work with your fishing rod and line combo to get you the results you’re looking for. A high performance reel with a 15 lb drag system, this is a solid setting that will help you handle some larger fish and worry less about line breakage (although no reel can 100% guarantee this). This design is durable, lightweight, and offers a great option for anglers on a budget looking for another quality reel for the rotation. Add in a 12 month warranty and the ability to use monofilament or braided fishing line and it’s easy to see why this option proudly rounds out our list. We grew up with these called “open face reels” because that’s what everyone called them, not knowing there were open faced baitcasting reels, as well. Whether you refer to them as spinning reels, open faced reels, casting reels, or something in between, it’s hard to argue with the effective touch and feel that these allow for precision casting and fishing. These are some truly outstanding open faced spinning reels, and we’re confident that if you go with any of these you’ll be happy with the results you get. There are many great reels out there, so keep an eye out, always be willing to test something new, and e-mail us that trophy fish picture when you reel that baby in!